Every year at Comic-Con International in San Diego one of the highlights for my inner child is this little flash back to days gone by. This visit to my childhood days, to playing with friends and siblings and remembering all the fun we had with madlibs before cellphones and digital games / videogames took over the entertainment environment. So while I may rarely reach for the madlibs as an adult, cosplay for beginners, a sampling of comic-con panels, and keeping cool around your idol were just a few of the pages in this years madlibs that tickled my funny bone when I flipped through the pages to see what fun awaited me when I went by the Penguin booth to pick up this years book. 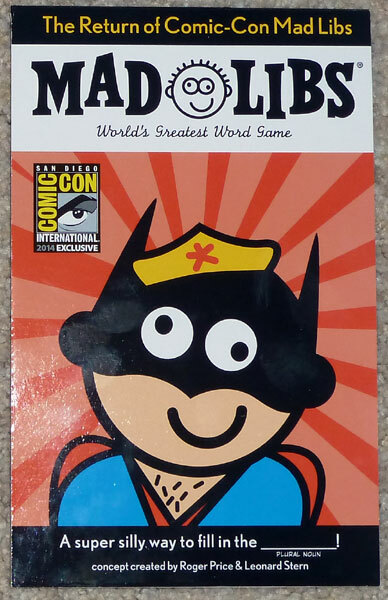 This entry was posted in Convention, Novel and tagged Comic-Con International, Madlibs, Penguin, PopArtsPlace, San Diego Comic-Con on July 31, 2014 by Kay.